A poker tracking database and a HUD is a must in today’s online gaming environment. The information it provides on your opponents and your own game is invaluable. Hold’em Manager 2 has developed into one of the most popular choices for this type of third party software. This is not only because of it providing one of the best databases and HUDs around, but also due to the ability to add-on powerful HM Apps to your software suite. The SnowieApp is a great example of the powerful apps around. The app takes advantage of PokerSnowie’s advanced neural networks to provide important feedback on your play. This in turn should help you to learn what it is you are doing right so you can continue to focus on this and what you are doing wrong so you can alter the way you play. 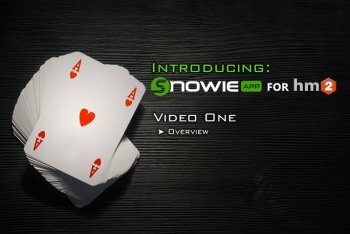 The SnowieApp connects directly to your Hold’em Manager 2 database to dig directly into your game. One important thing in poker is to remain balanced. If your opponents understand exactly how you play, your game becomes very exploitable. This is especially true to advanced opponents or those also using third party software to help them profile your game. The SnowieApp has your back here, and provides a Balance report. In this feature, the app shows how balanced you are and recommends changes as it examines your game. For example, from the report, it might tell you that you are raising a balanced amount preflop, but then betting too often on the flop. It might then recommend that you bet less often with weak strength hands on the flop or even consider doing the same with your strong hands to try to slow play your opponent. The Error Summary is another great feature to the software. What this does is provide what your major and minor errors are by street or by error type. You may see for example that you are making few errors preflop, but tons of errors on the flop. This allows you to know where to focus the most to improve your win rate or transform from a loser to a winner. The software also features a helpful Hand Advice component. Under the hand viewer snapshot, you can see each hand and how much EV you may have lost based off your actions against how the SnowieApp’s intelligence recommends you to play it. You can also drill down into each hand into a hand history replayer to learn from the SnowieApp’s guidance on how it would play on each move on each street. This is just the tip of the iceberg as far as how powerful the SnowieApp is. There are tons of other useful tips you can learn about the app by watching videos or asking questions on the Hold’em Manager forum. The SnowieApp is just one of many great reasons to use Hold’em Manager 2 as your poker tracking database. The app costs $99.99 per year, which is very cheap considering how powerful it is. Even if just correctly some of your leaks, regardless of the stakes you play the software should pay for itself and much more in no time.